Brooks and Rique desperately want to win the head chef’s position for eccentric millionaire Jonah Verleun on his beautiful, private, but peculiar island that includes a zoo full of exotic animals, an amusement park, and a monster shark tank beneath Jonah’s bedroom floor. While Brooks wants the job to escape his heartache and the lover who thwarted him, Rique is hiding from the mob hoping to live long enough to pay them off with the prize winnings. Fierce competitors, they cook up a storm in a series of cooking challenges all the while trying to turn down the heat on their intense attraction. 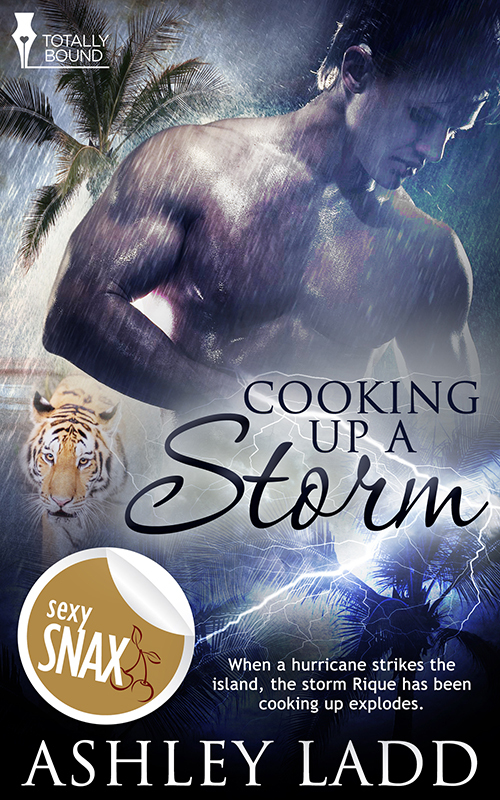 When a hurricane strikes the island, the storm Rique has been cooking up, explodes and no heart or body are safe. Troubling thoughts whirled through Rique’s mind. Why had Jonah called him and Brooks into his office? Had they violated some fine-print rule he’d missed? Had Jonah learned about his debts and Mafia troubles? Gulping, Brooks shared a worried glance. His gait was uneven and stilted and his frame was stiff and wary. “Are we in trouble?” Brooks whispered. Worried about the reason for their summons, Rique forced himself to relax and not shake his head at his lover and his loose-cannon lips. As much as he was beginning to love Brooks, there was no way he could share his mob secrets. Not only would they overly alarm Brooks, but the security team might overhear and he didn’t trust anybody. Damn! Rique gulped as they pulled up chairs across from their boss. So they were in trouble. Too late, he realized his toes were tapping fast and that his fingers were linking and unlinking, so he stilled them. “What about the contract?” Brooks inched forward in his chair and wrung his hands in his lap as his eyes bulged. Jonah bent over the desk then he pointed at the security cameras. He watched a deep flush crawl up Brooks’ neck and into his cheeks as Brooks begged. Fall in love? Shock and wonder filled Rique. Warmth flowed through him. So Brooks felt the same way he did. Giddiness replaced the dread born moments before. He couldn’t believe he’d just said that. Damn my heart! Laughing heartily, Jonah slapped the table, causing a few sheets of papers to float to the floor. Cooking up a Storm is a short novel about a cooking competition that ends up dangerous on a remote island. While I would have liked to see more of this story , the amount of hotness and action for the pages were proportional. I loved how the author wrote the characters each with their own unique descriptions. The plot was fun and had originality because of all the various scenes that was in the home of the owner (I would love to have a few of these). Not sure about the sharks I think I would feel the same way that one of the characters would have. I would have liked to see a little more feeling passion between Brooks, Rique, and Jonah. Overall this novel was a quick spicy, humorous, with a kick of adventurous read that you should read. 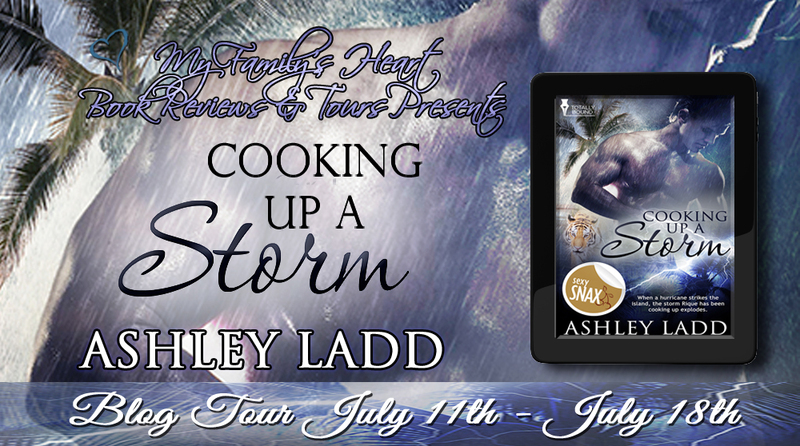 Ashley Ladd lives, loves, and writes in Paradise, aka Florida, thus many of her stories are set in the Sunshine State. Also a Trekkie and an Air Force disabled vet, Ashley often creates military heroes and heroines and goes where no woman has gone before. She loves romantic comedy, time travel, and cats so don’t be surprised if a talking cat shows up in some of her stories. To follow her on Twitter and Face Book, look for “AshleyLadd” (all one word, no quotes).